ATIT Application Form (आईसीएफएआई टेक प्रवेश परीक्षा आवेदन पत्र) 2017: ICFAI university has recently released an official notification at its website, i.e. atitindia.org and hence it has invited the online applications from the candidates meeting the eligibility norms in all the aspects on or before the last date. 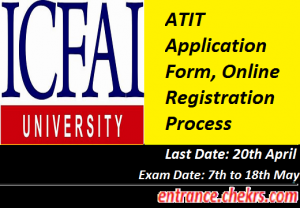 After the online submission of the Admission Test for ICFAI Tech Application Form 2017, candidates need to take the printout of the application form and then they have to submit the hard copy of ATIT Online Application Form 2017 to the address mentioned below on or before 20th April 2017. Then after the scheduling of ATIT from 6th March 2017 to 4th May, candidates have to appear for the entrance exam from 8th May to 20th May 2017. This is National Level examination for the undergraduate applicants. The IFHE offers various engineering programs to the applicants who are interested in carrying their engineering studies from ICFAI university. Visit ATIT Official website, i.e. atitindia.org. Click on “Apply Online” link after following the notification section. The online form will be shown to you, fill all the entries with authentic details. Attach the scanned copies of all the necessary attachments. Pay the required application fee in the suitable format. Applicants have to visit the official website of ICFAI, i.e. atitindia.org/. Now click on the application form and download the application form. Fill the application form correctly. Attach the copies of the photo, signature, and all other necessary documents with the application form. Submit the completely filled application form along with all the necessary attachments to the given address. Applicants can pay the application fee through the online payment mode using credit card/ debit card/ net banking or they can also pay the fee in form of Demand Draft of Rs. 700 in the favor of ICFAI University. The candidates have to submit the completely filled ATIT 2017 Application Form in both the applications formats, i.e. Online as well as Offline on or before the last date, i.e. 20th April 2017. Only the candidates meeting the eligibility norms in all the aspects are invited to apply online for the Admission Test ICFAI Tech and the candidates can do so by following the steps or the direct link given above. All India Admission Test is used to be conducted by the ICFAI Foundation for Higher Education (IFHE), Hyderabad for engineering admission. For any of the queries concerning the ATIT Online Form 2017 submission, you can ask us by commenting at the end of the post.